After a very busy Monday this week with work, I didn’t have my usual soup – I had leftovers from the weekend. Over the weekend, I had a few more treats than normal, so when Monday came I was more hungry – and quite tired but I managed to take control of it. 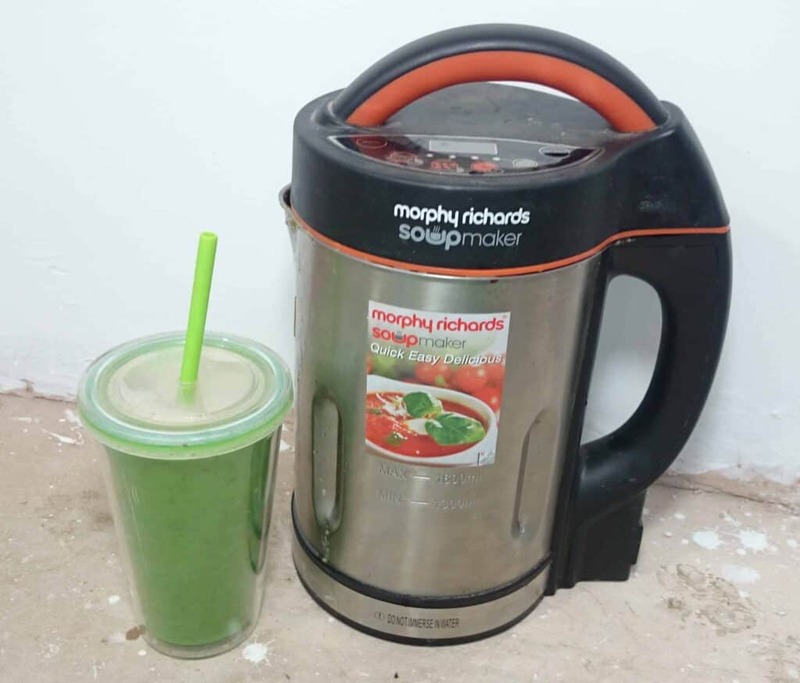 I have been meaning to make my Morphy Richards Soup Maker jump through hoops for me, so to speak, by putting it through many tests when it comes to the other functions it has to offer: the juice feature and blending option. My kitchen is so tiny, limited cupboard space does not permit me to own a blender/smoothie maker too, so it would be advantageous if I can find perfect smoothie recipes to create and share which is where this blog comes in. Monday afternoon I felt I needed something sweet for energy, so after a while of talking myself out of it, I settled for a raw natural option; this way I could also try something new (dairy free) and feed my body with extra nutrition. I have struggled with smoothies when it comes to the soup maker. The blending blade is not big enough so is not the perfect tool for blending firmer foods. You won’t be able to blend a small amount and would say I have only had success when creating a large full glass size portion – perhaps you may prefer this anyhow but sometimes I can struggle to finish them. I decided I wanted some antioxidants too boost my immune system, so I used the last of my strawberries and added some raw broccoli for some Vitamin C with a touch of fibre as part of my healthy extra. Firstly I tried the Juice feature with high hopes which is a high blend for 2 minutes – this I am sure would work perfectly with softer fruit or vegetables but the broccoli was extremely challenging and still had lumps. I then had to increase the liquids in the recipe for a more effective blend. Once I achieved this, I ended up with a consistently of raw minute broccoli nuggets which were the the texture of crushed nuts. The sweet subtle roasted almond flavour from the vegan milk when perfectly hand in hand with the strawberries. I was left feeling fulfilled and content until my evening meal came along – by this point, I felt I didn’t need a large meal. I felt less pressure to cook something convenient and so had time to prioritise with healthy ingredients as opposed to fatty ones. Did you syn this as you used weetabix and blended fruit. I think it would be quite high in S/W syns! I’m interested in you broccoli smoothie recipe and wondered if you have had any success with eg kale?